How deep is Key in this mess? 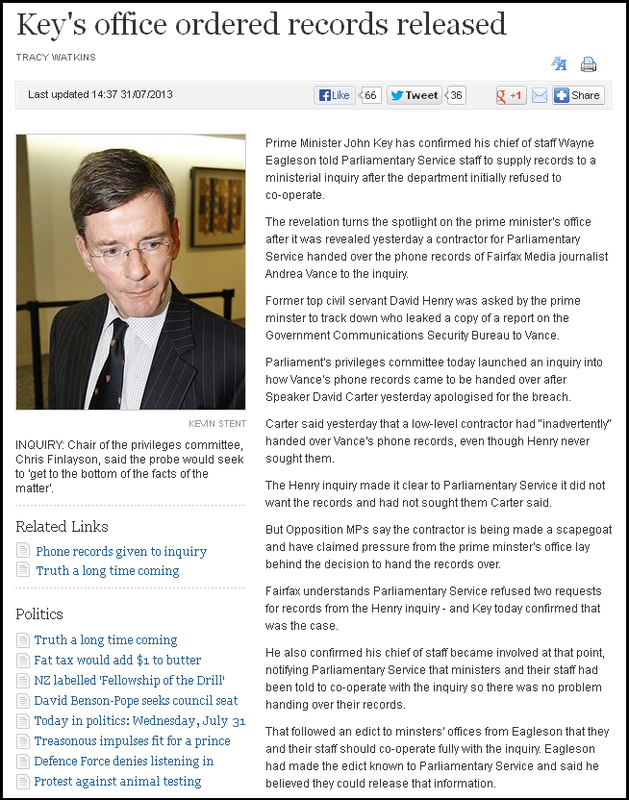 It now appears that the Prime Minister’s office was involved in obtaining Andrea Vance’s phone records. 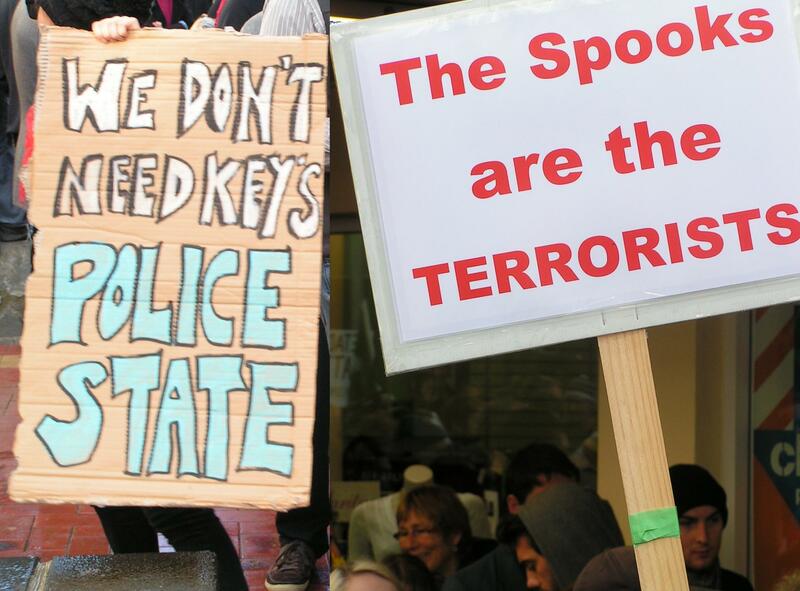 If it can be shown that Key was directly involved – this government will fall. Governments of all hues, after a while, begin to believe their own spin. Their arrogance in knowing “what is best” for the people grows with each passing day as they listen less, and dictate more. “At the risk of encouraging them to have more protests, I would actually say those numbers are quite light. It wasn’t anything like what we saw for mining or anything like that. He may be the Prime Minister. He may be on a salary of $411,510 (plus perks). 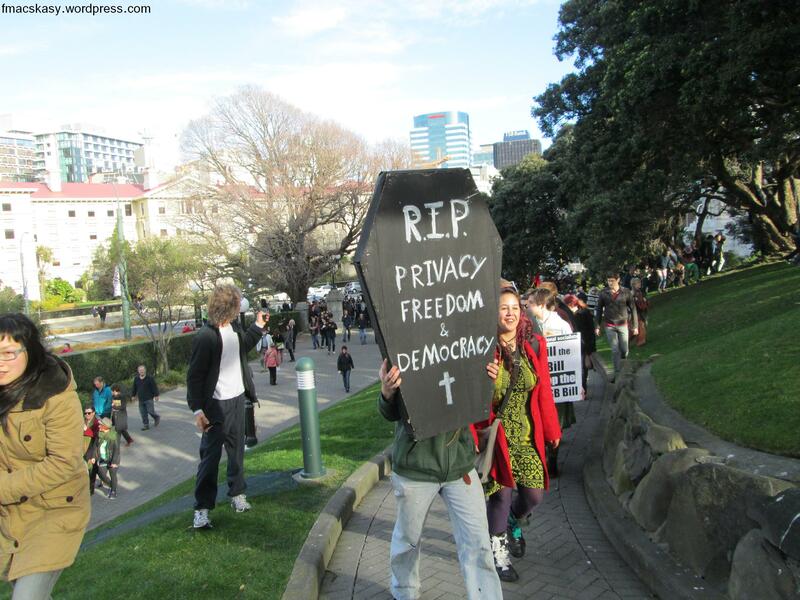 He may pass laws that curtail our freedom and privacy. But in the end he is a civil servant; an elected politician; and one who sits in his office at the will of the people. Politicians who forget that come to a sticky end in some countries, or in democracies like ours, face the embarressment of being thrown out at the next election. 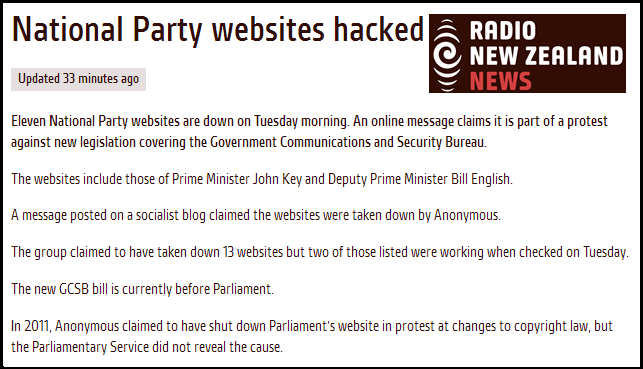 The hacking of National’s websites is another indication of mounting anger from New Zealanders at National’s dismissal of our concerns and ploughing ahead with unpopular and un-needed legislation. 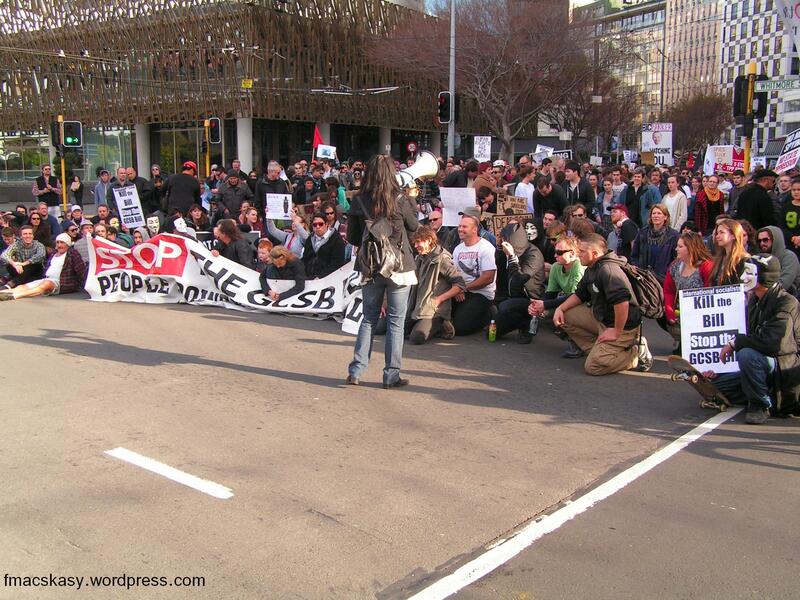 When governments go bad, they should expect resistance, not respect. 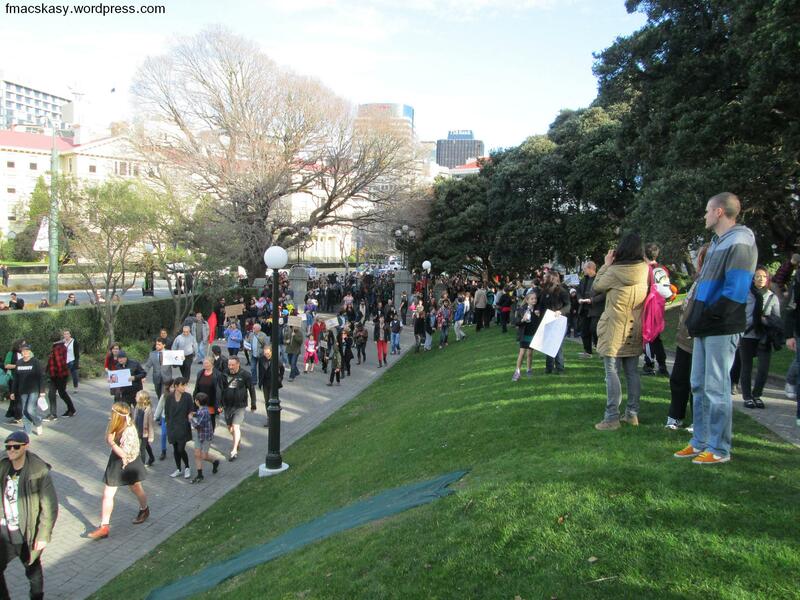 NZ, Wellington, 27 July – The peaceful protest march had arrived at Parliament without incident, and people were in good spirits. 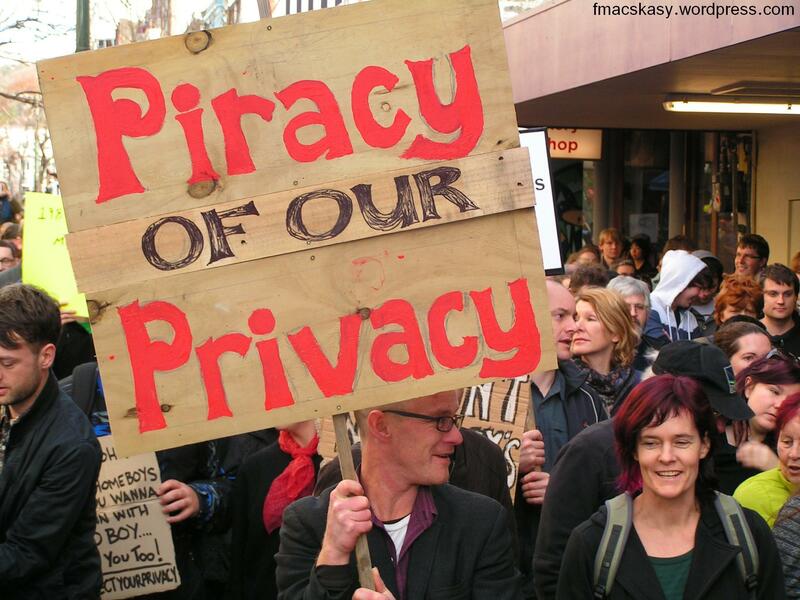 Question – when did we arrive at a state in our affairs when we have to plead for privacy from our own government? Is that a statue of Lenin holding the red flag?! That looks a tad more than “500” to me. 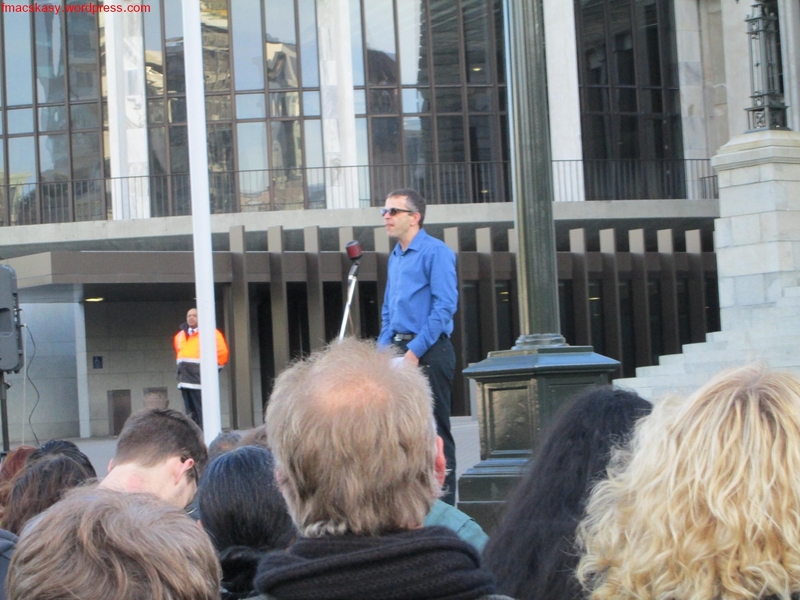 My guesstimate – between 3,000 to 5,000 people. 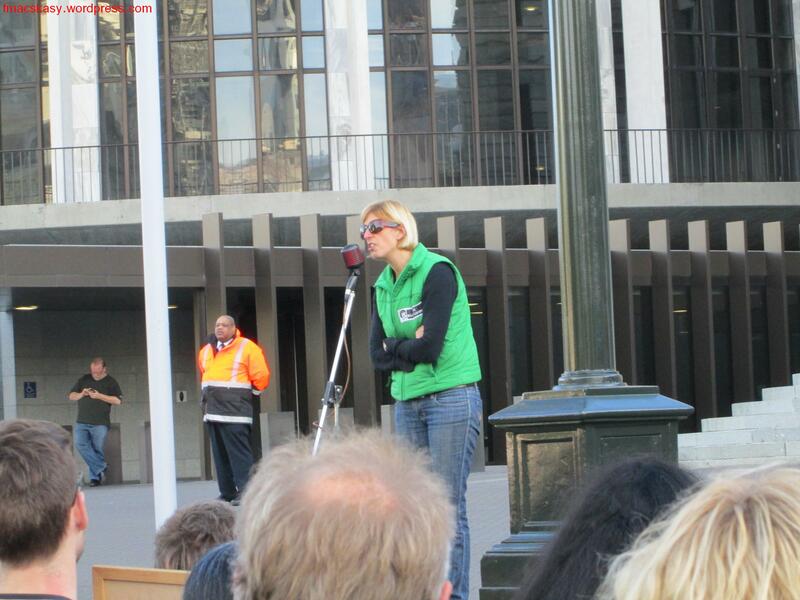 Green Party co-Leader addressed the rally. He said that when National MPs sneer at you, remember that they are frightened of you. 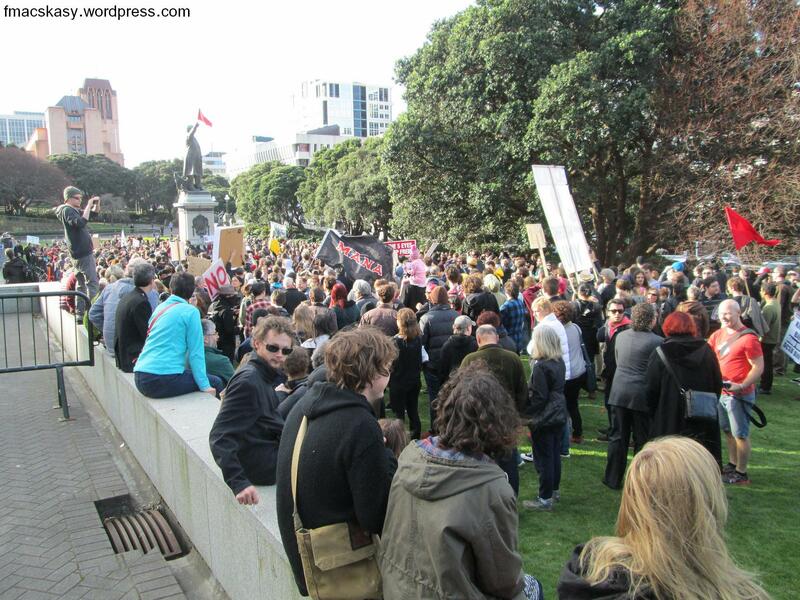 With a wry grin, and semi-seriously, Russell also suggested that everyone submit OIA requests to the GCSB asking how many had attended the rallies around the country. He said it might be fun to tie them up so they could not spy on us. 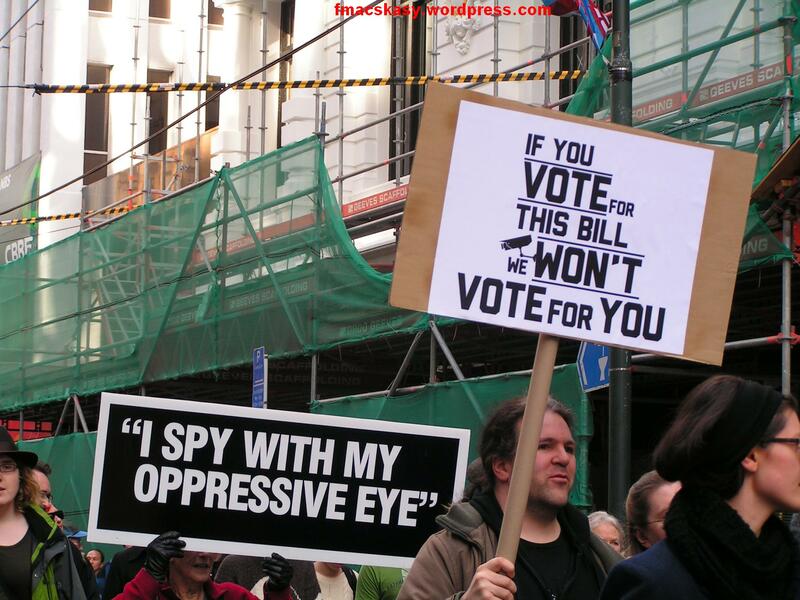 He finished of by repeating that “we should reject mass surveillance and reject this Bill“. He encouraged concerned citizens everywhere to “disarm the plastic covers on the spybase” and put the facility out of operation. 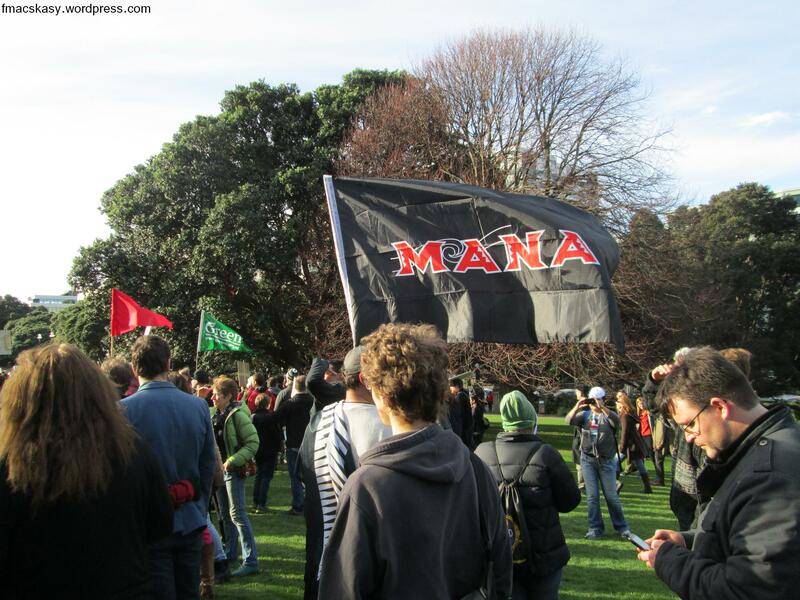 He said the Waihopai base spied on the United Nations, including diplomats and staff. 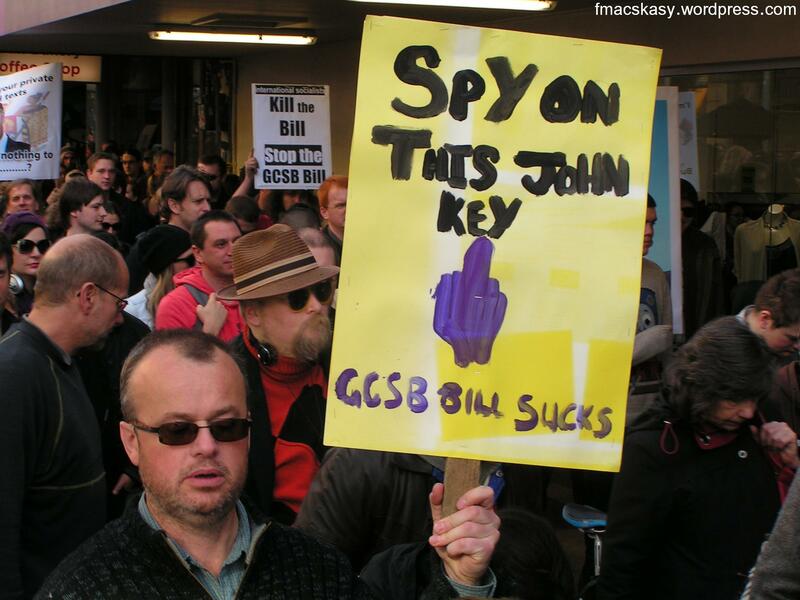 Adrian told the rally that Warner Bros had requested the GCSB to spy on Kim Dotcom. He said that worrying about the loss of our privacy was only “one piece of the bigger puzzle”. 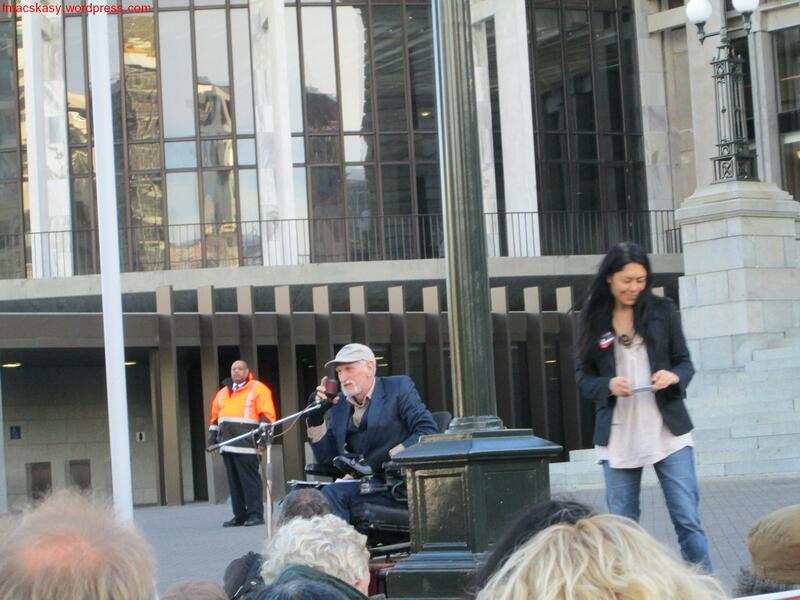 His address was warmly received by the rally. “It’s about spying on everyone, no matter what they’ve done, no matter what they’re going to do. 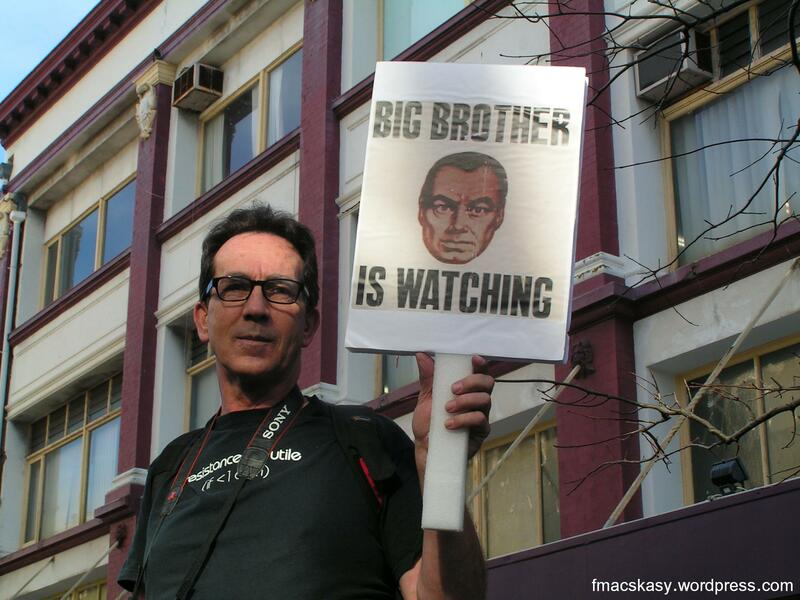 This sort of mass surveillance changes the balance of power in our society away from the people and towards the state. I believe in the right to privacy, I believe in the right to sit in my house and call my friends on the phone without the Government listening. Valerie read out a long list of legislation that successive governments had passed over the last decade that had, in some way, taken away some aspect of our civil liberties; increased the power of the State; or elevated the primacy of corporate power over our own rights. 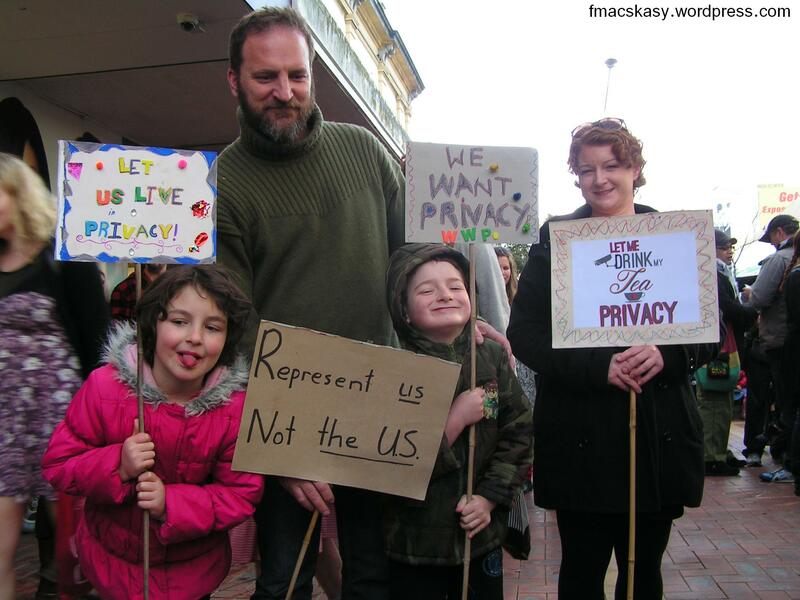 She condemned the GCSB’s close links to American spy agencies, saying that we “do not need our every movement logged by the NSA“. 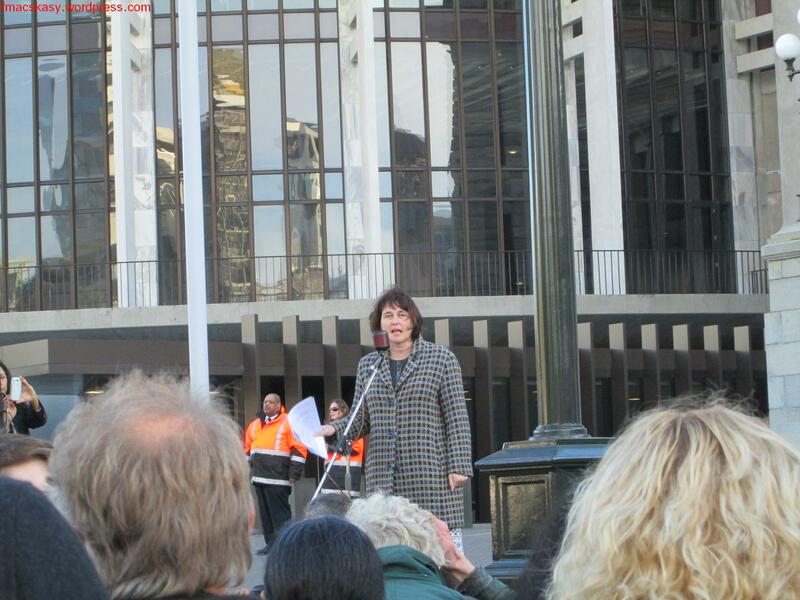 Helen said that this government was becoming a bully. She said, “Don’t buy into ‘nothing to fear so have nothing to hide. We all have things we want to hide and keep to ourselves“. That was called privacy, she said. 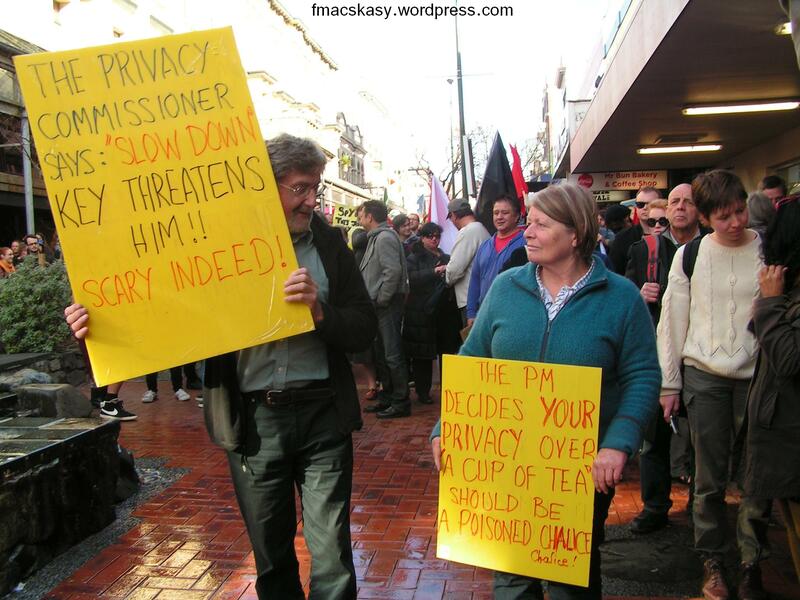 Chris said that there was a fundamental principle that we all have a right to privacy. 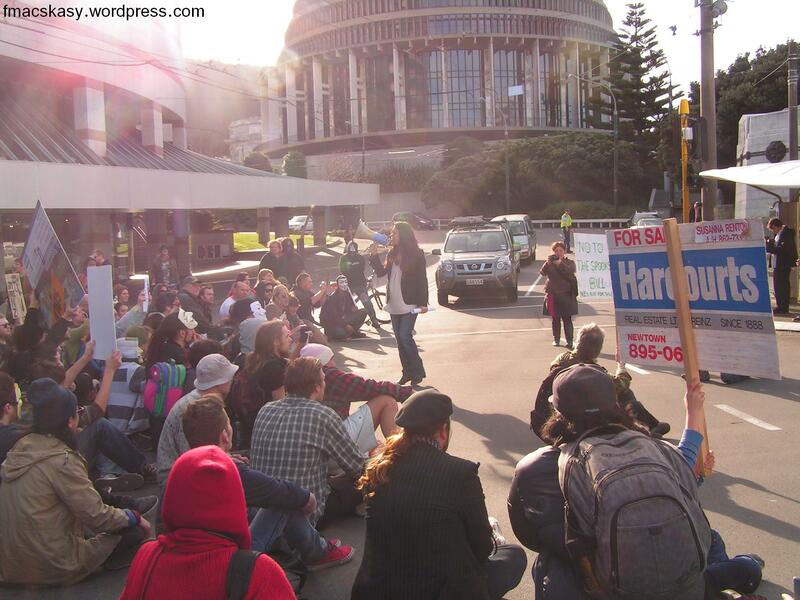 He criticised Ohariu MP, Peter Dunne as “wrong to sell his vote“. This is another clear indication that Labour is committed to repealing this damnable piece of legislation, should it lead the next government. We will hold them to that promise. In which case, what does it profit National, and it’s smile and wave leader, to pass unpopular legislation, knowing that it will not survive a change of government? 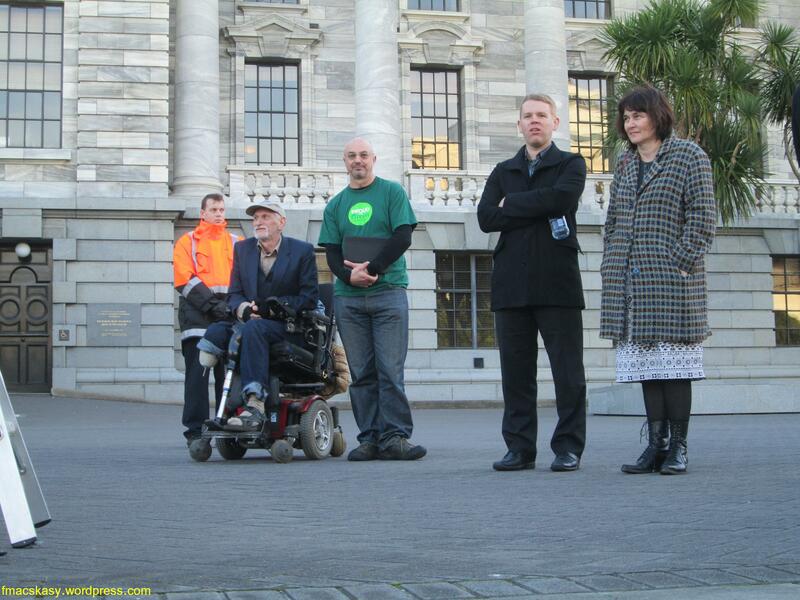 In Kiwi parlance, the Nats are on a hiding to nowhere. 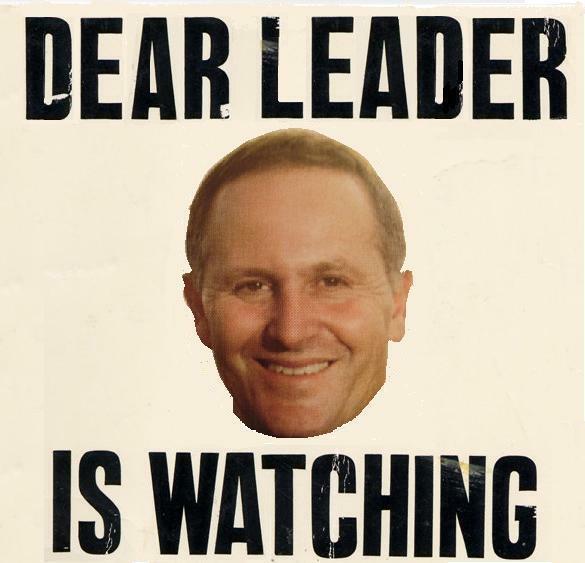 Time to give it up, Mr Key. 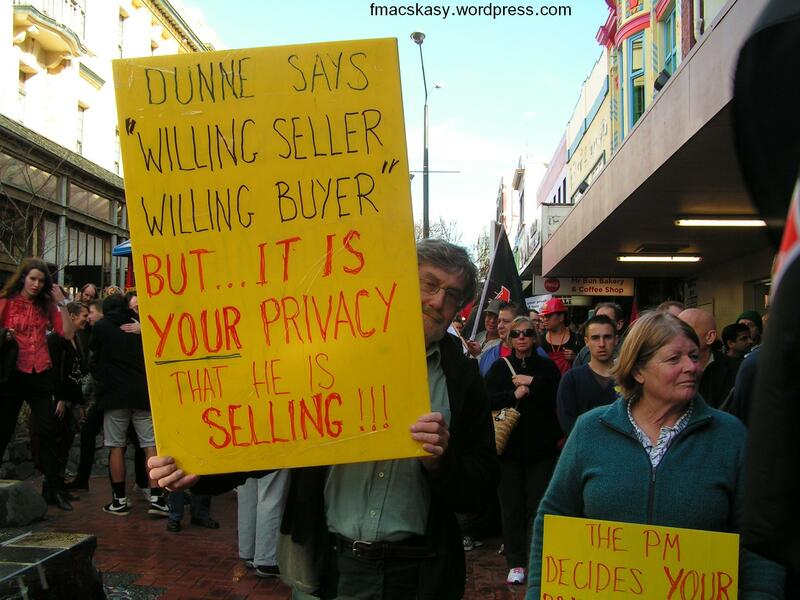 Ironically, it is Peter Dunne who will not release his email correspondence between himself and Fairfax journalist, Andrea Vance, insisting on his privacy – or “Parliamentary privilege”, as he calls it. I hope Parliament’s air-conditioning is working properly. The stench of hypocrisy must be over-powering. 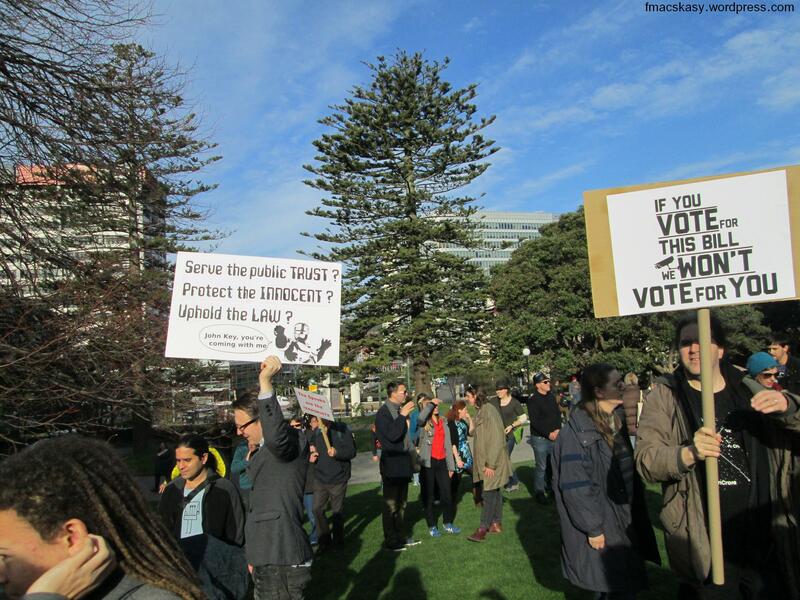 A 3News Reid Research poll released on Thursday night asked 1000 voters who they believed – 52 per cent said Dotcom, 34 per cent said John Key, and the rest didn’t know or didn’t care. 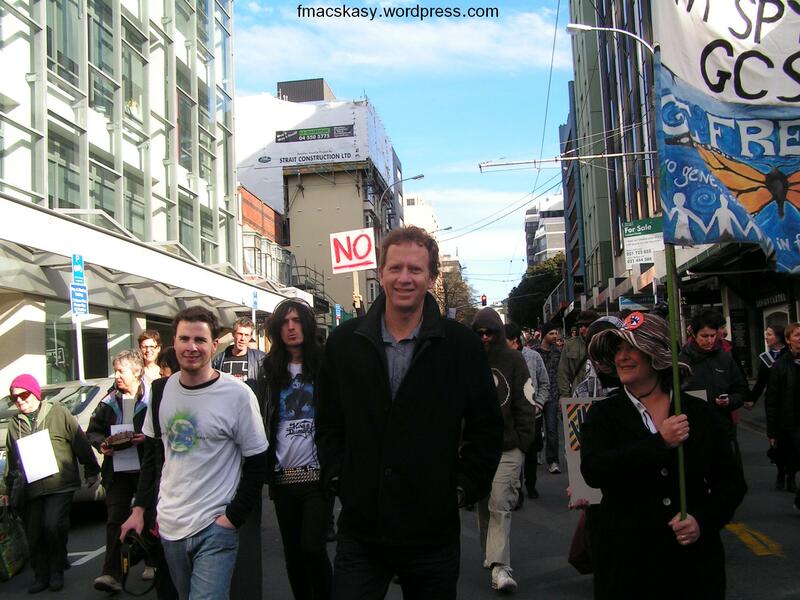 If I were Key, I would not be so smug and arrogant as to think that we trust him to “protect the interests in New Zealanders”. 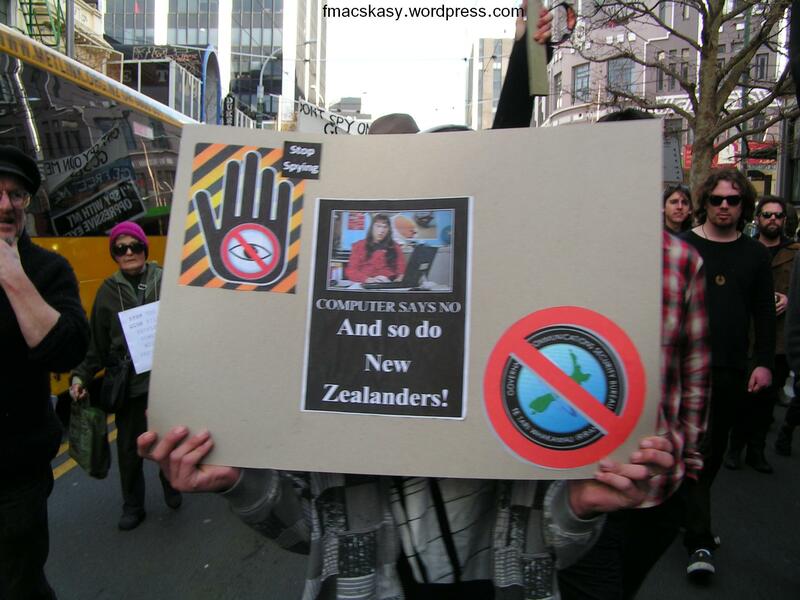 Spying on New Zealanders is not “protecting our interests”. More likely, it suggests how much he fears us. This blogpost was first published on The Daily Blog on 29 July 2013. Use must be for non-commercial purposes. Where purpose of use is commercial, a donation to Child Poverty Action Group is requested. At all times, images must be used only in context, and not to denigrate individuals or groups. Acknowledgement of source is requested. 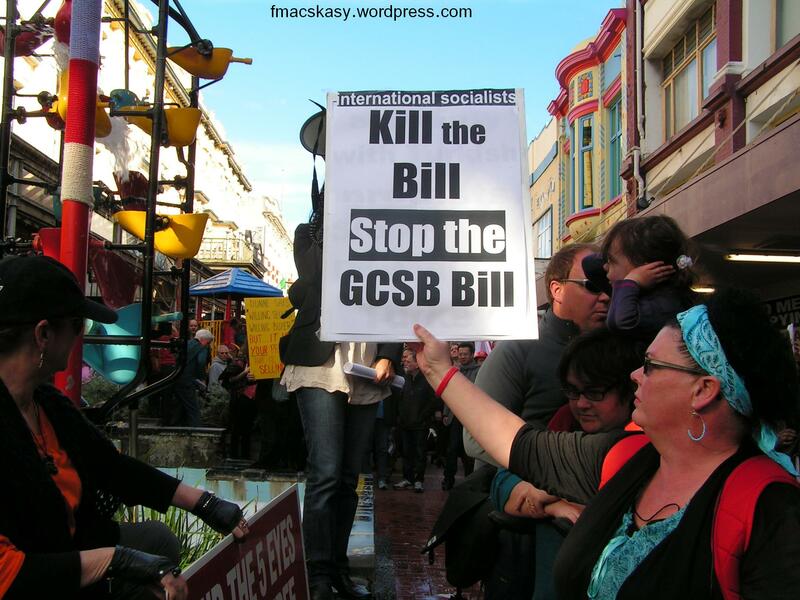 NZ, Wellington, 27 July – Wellingtonians (and from further afield) met downtown in Cuba Mall, to protest National’s planned GCSB Bill. 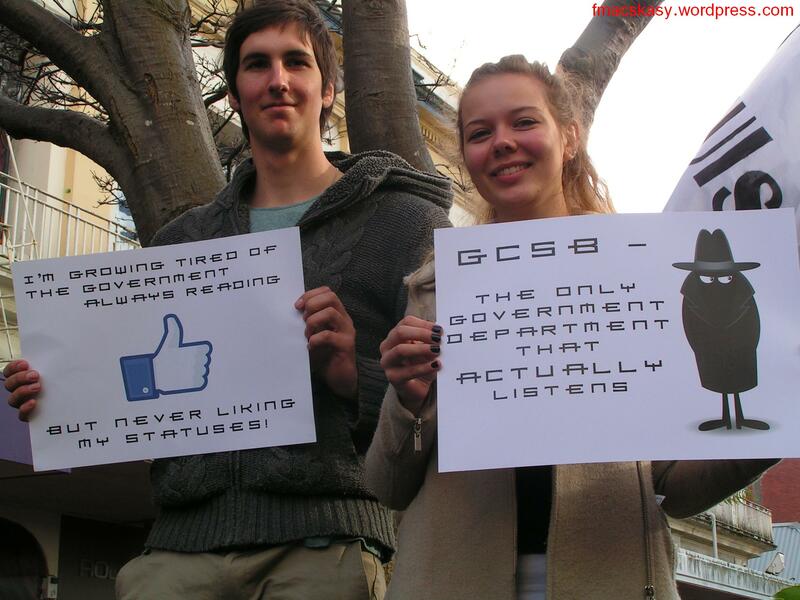 Who says that young people aren’t interested in politics or political issues any more? 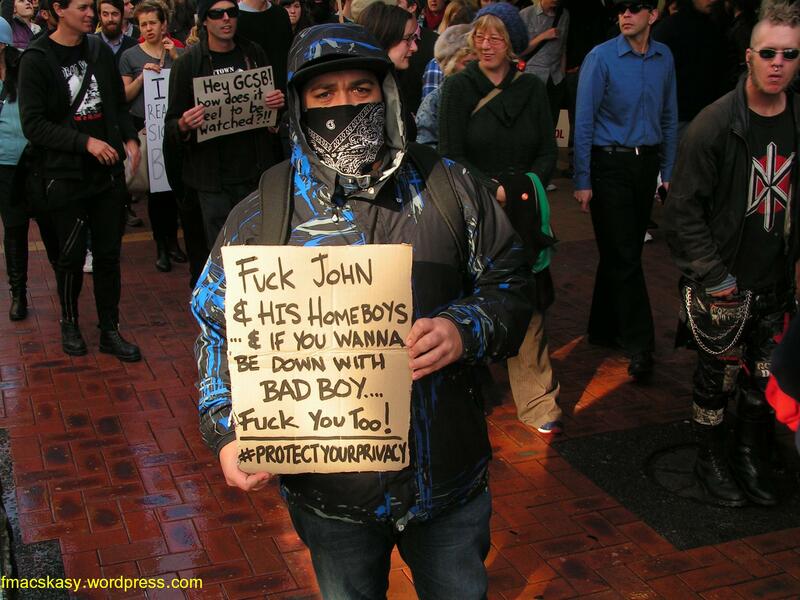 I went up to Eddie and asked his why he called the protesters “retards”. 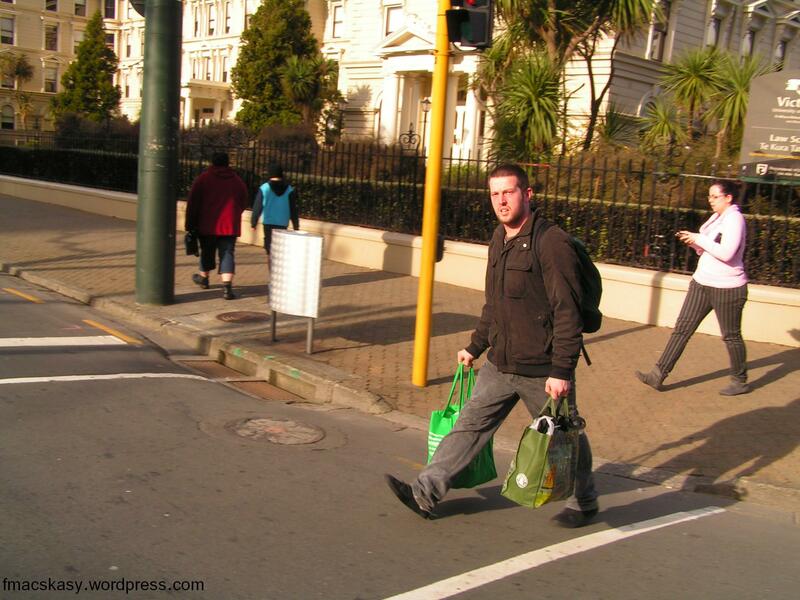 Eddie was upset that buses had stopped moving up Lambton Quay and he was worried that the chicken he had bought at the supermarket would develop salmonella. 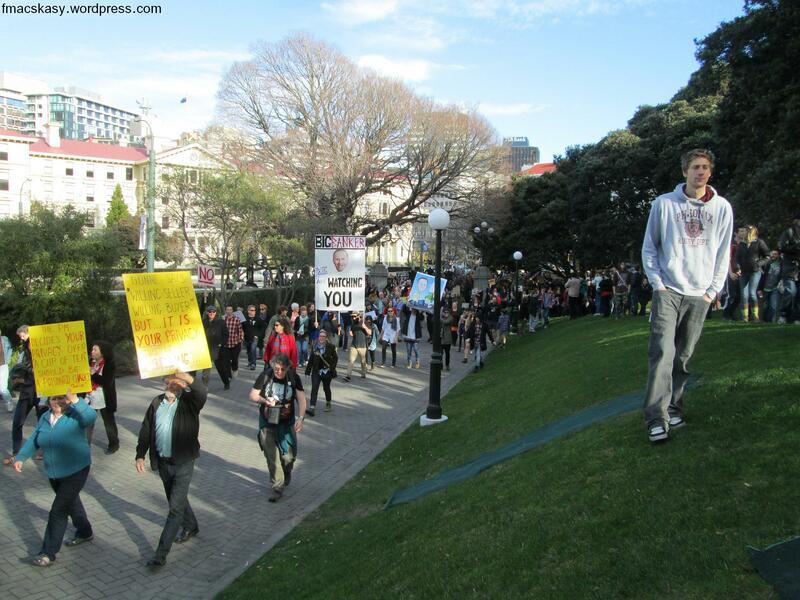 He said the protesters should be marching along the footpath and not the road. 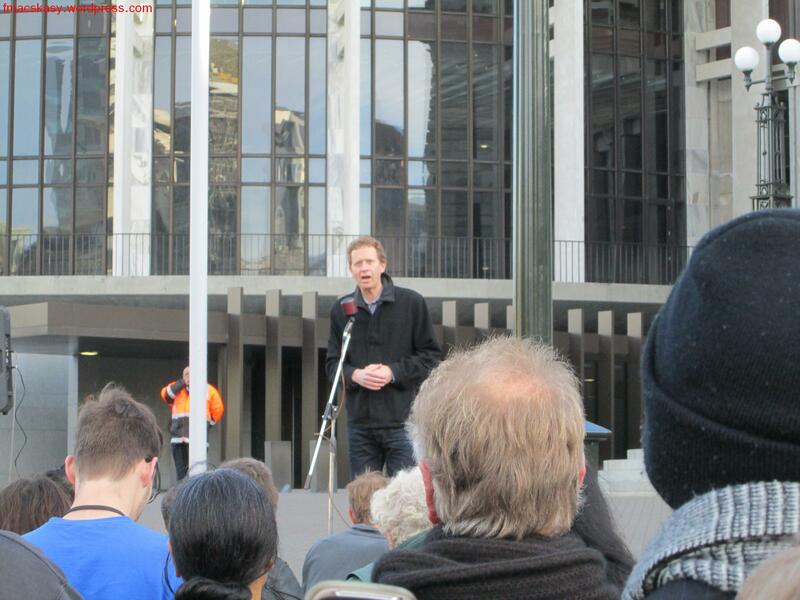 I asked Eddie how 3,000 to 5,000 people could fit onto a footpath. He had no response. 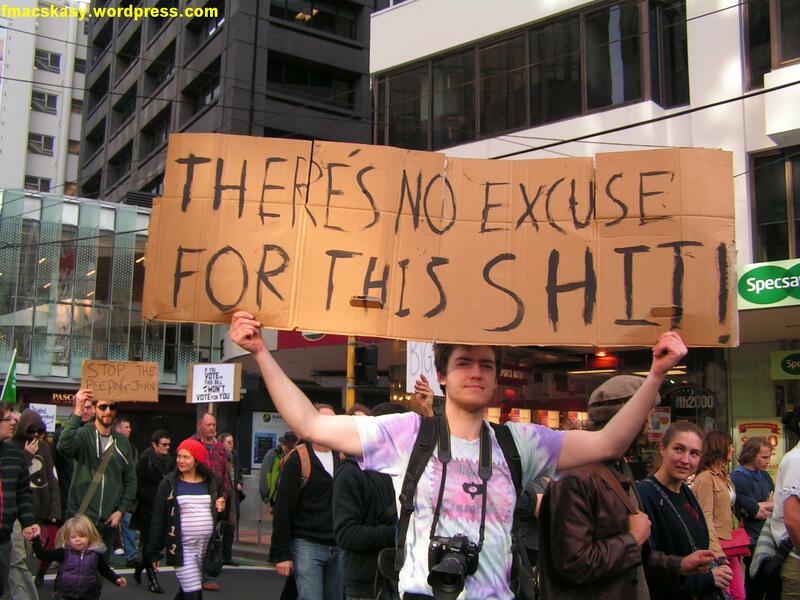 He said the protest should have taken place when people weren’t at work. 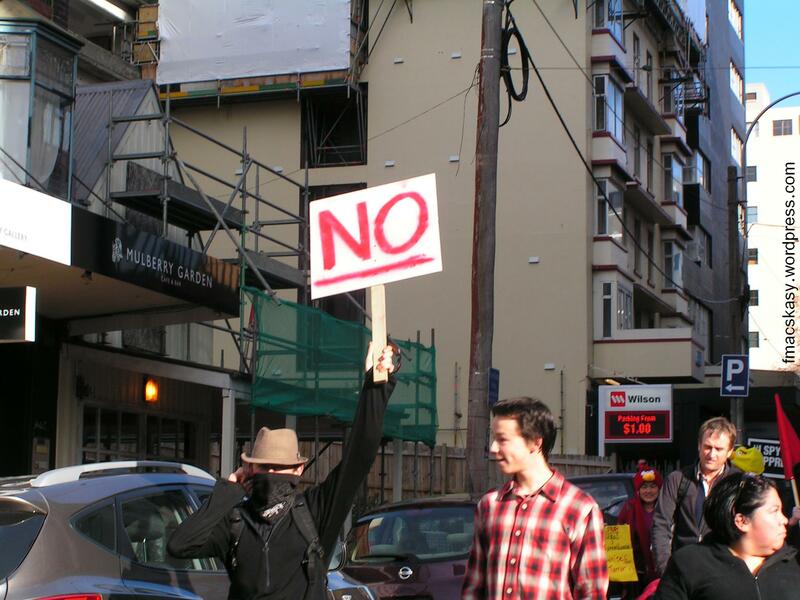 I suggested to him that a protest march of this size would be less of a nuisance to traffic on a Saturday afternoon than had been held during the week. I then asked him if he knew what the issues surrounding the GCSB Bill were, and that maybe it was important enough to warrant a temporary, minor inconvenience. At first Eddie denied knowing anything about the issue. 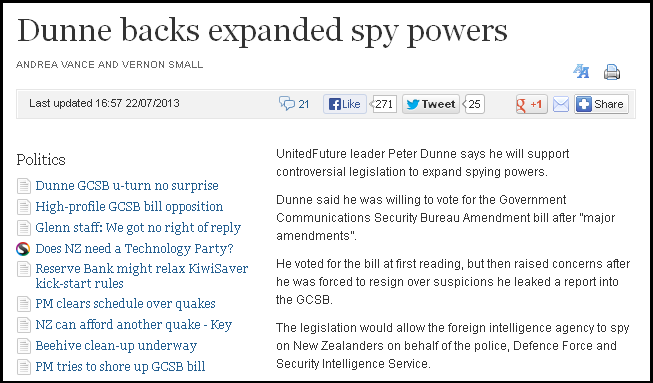 When asked again, he admitted knowing that the GCSB’s powers were to be expanded “to spy on us all”. 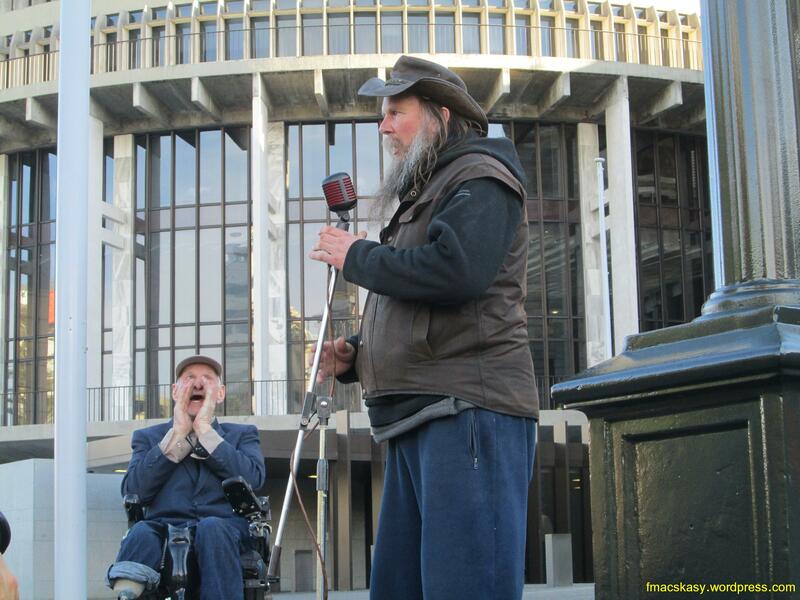 When I asked him if that was an important issue of public concern he muttered something and walked off. I hope he enjoys his chicken. 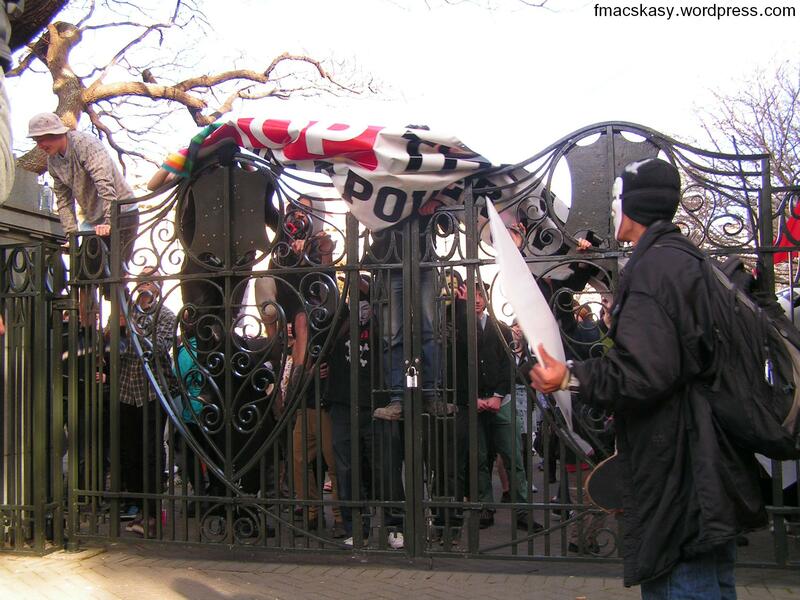 Meanwhile, those with more pressing issues on their minds had reached the entrance to Parliament – only to find that the main gate had been locked. 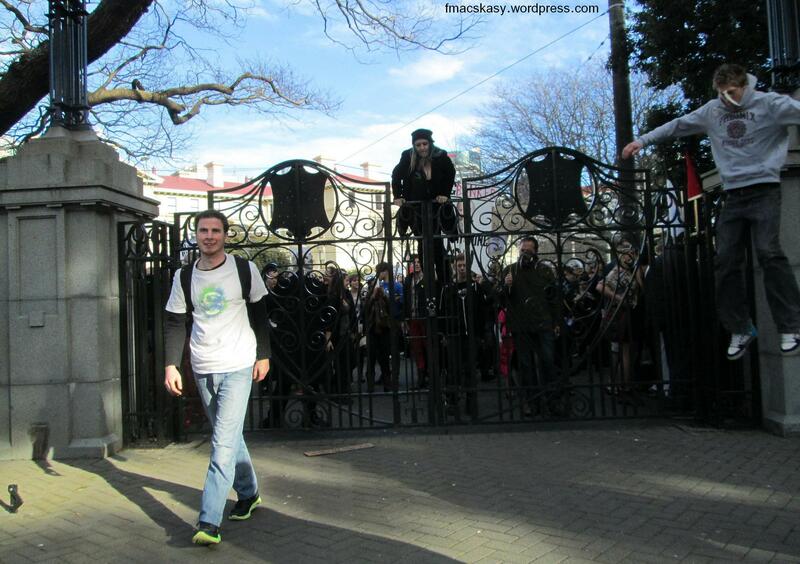 Only two side-gates, which were barely wide enough to allow passage for one or two people at a time, were open. 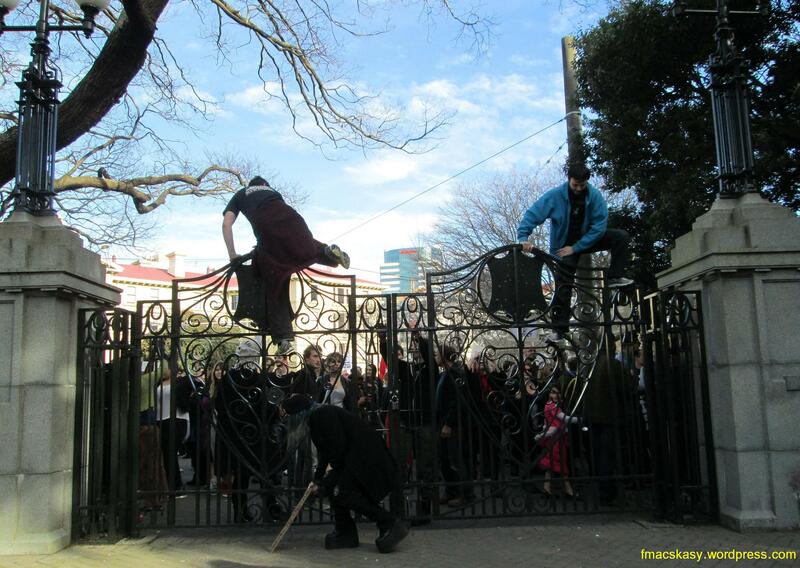 A note to the smart-arse news-editors on TV3 who quipped that protesters climbed over the main gate “even though there was another gate open right next to them” – mis-representing an event does not inspire confidence in your ability to be accurate and fair in your reporting. 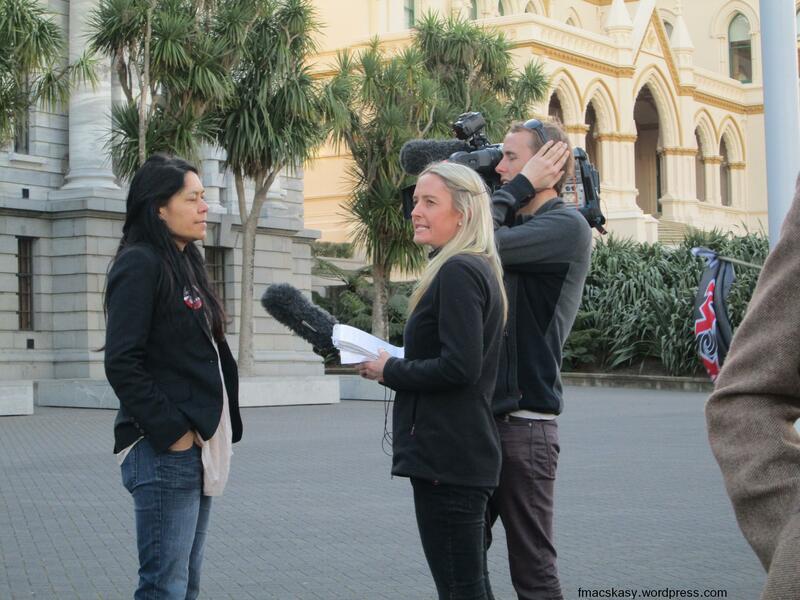 Very disappointing that TV3 chose to make such a cheap shot. 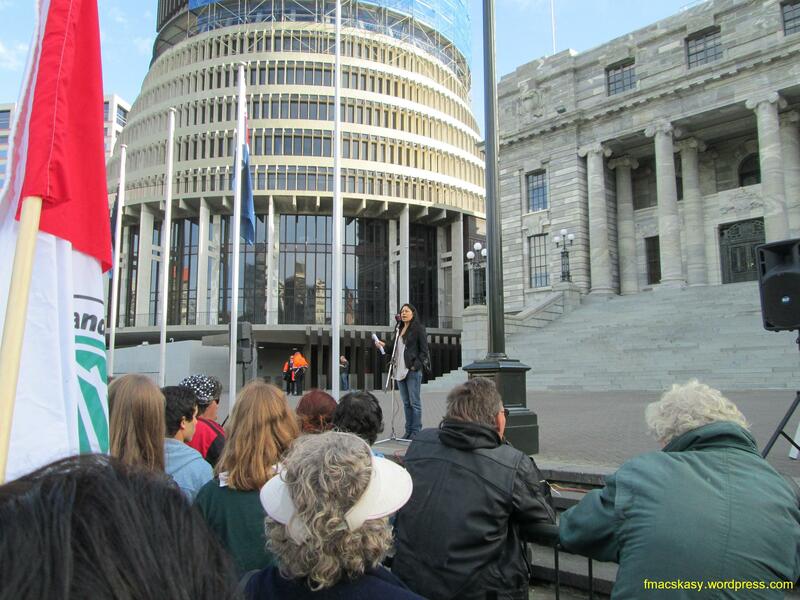 Parliament’s grounds were once again in the possession of the People. 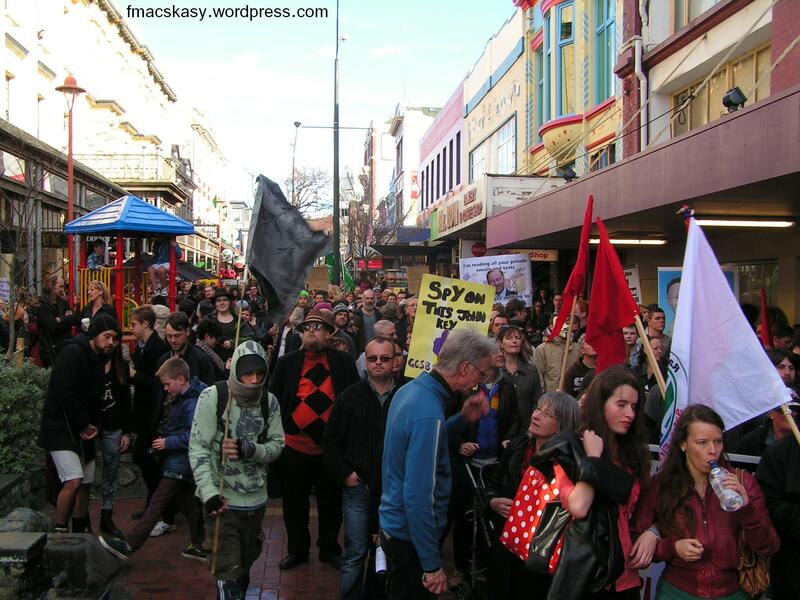 NZ, Wellington, 27 July – Between 3,000 to 5,000 people (not the “500” estimated by the Dominion Post, NZ Herald, and TV3) took part in a march in Wellington on a bright, warm Saturday afternoon. People assembled in Cuba Mall near the Bucket fountain, and when we arrived there were already at least a thousand people in attendence. Dunne must be either brave or foolish to be alienating his voters in this fashion. 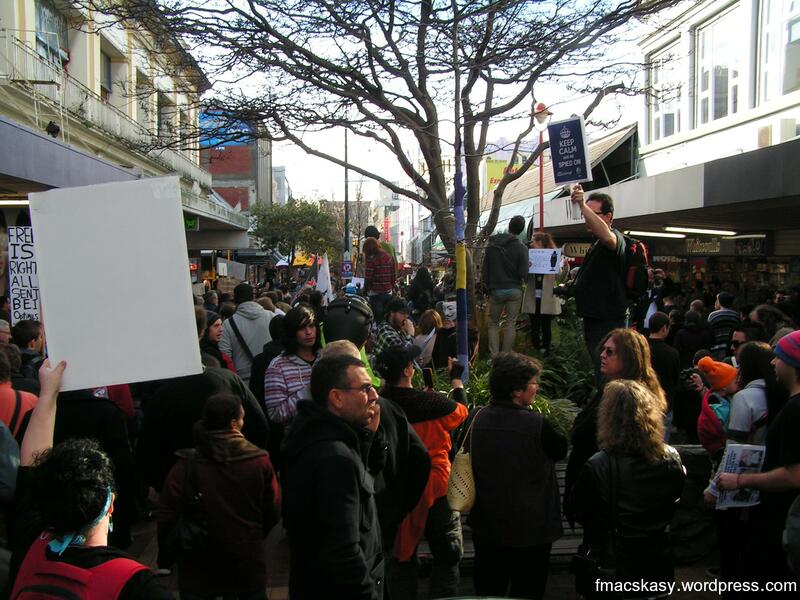 Politicians should take note – the protesters weren’t just radicals, activists, and suchlike – these were ordinary New Zealanders who rarely take to the streets. 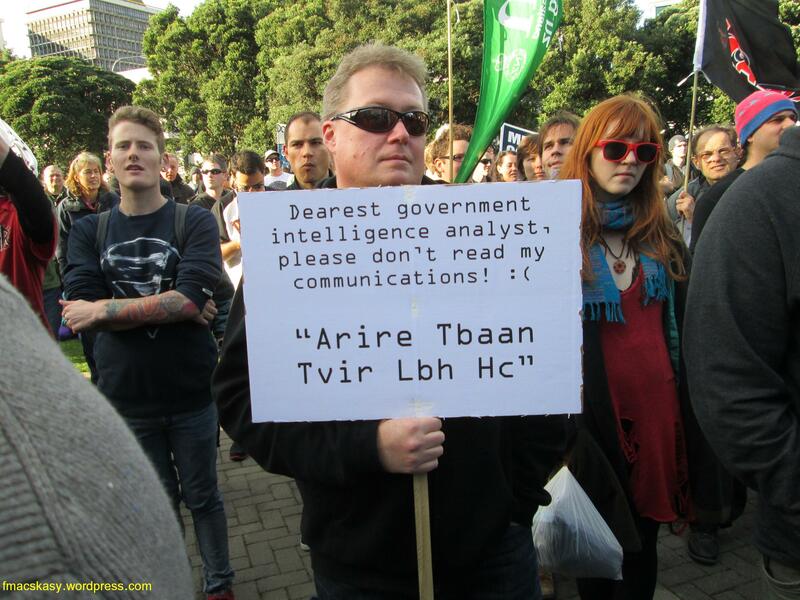 Peter Dunne has capitulated to John Key’s “compromises”, and will give National his support to pass the Government Communications Security Bureau and Related Legislation Amendment Bill and it’s sister Bill, the Telecommunications (Interception Capability and Security) Amendment Bill. 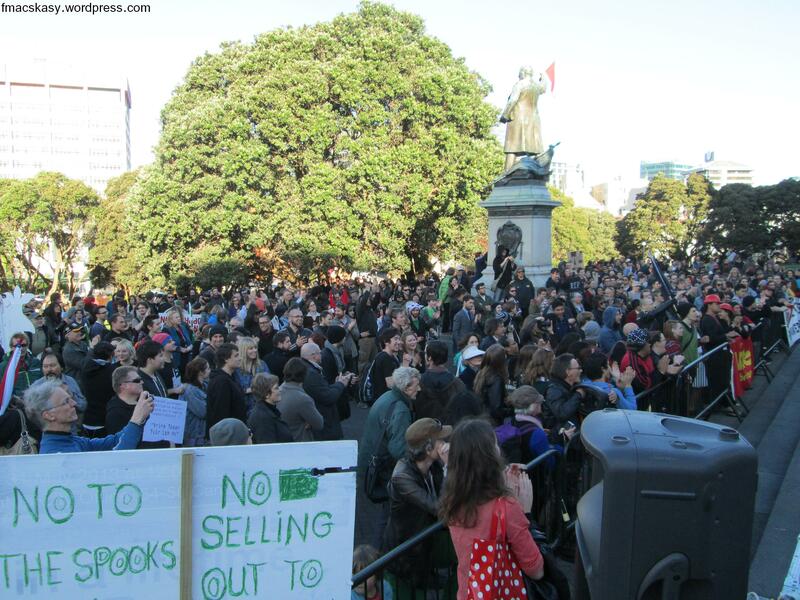 Peter Dunne’s sell-out should bring no joy to civil libertarians and to those New Zealanders who understand the full implications of these two proposed laws. 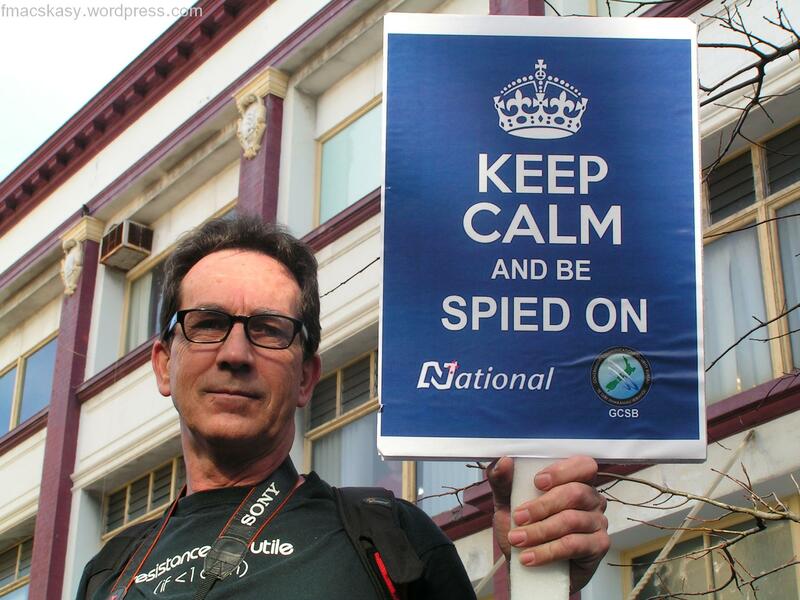 Every New Zealander will now potentially be under surveillance. Everyone. The numbering of children will begin with beneficiary families. That’s how it usually begins; with those at the bottom of the socio-economic heap, and who have been so completely dehumanised by constant vilification and finger-pointing that the Middle Classes no longer consider them as human. Certainly not people they feel empathy with. Such is the purpose of well-designed, repetitive, propaganda. The Big Lie. 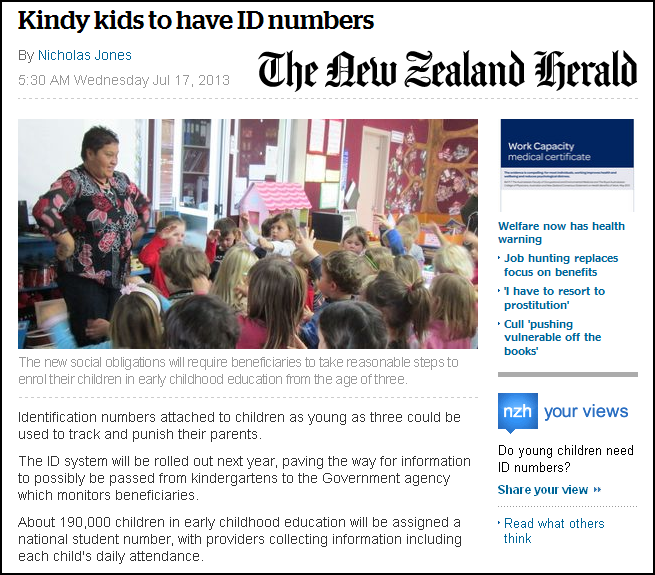 Of course, once New Zealanders are accustomed to the numbering and surveillance of beneficiary children – National will eventually expand the programme to include all children from all families. Everyone will become a number. 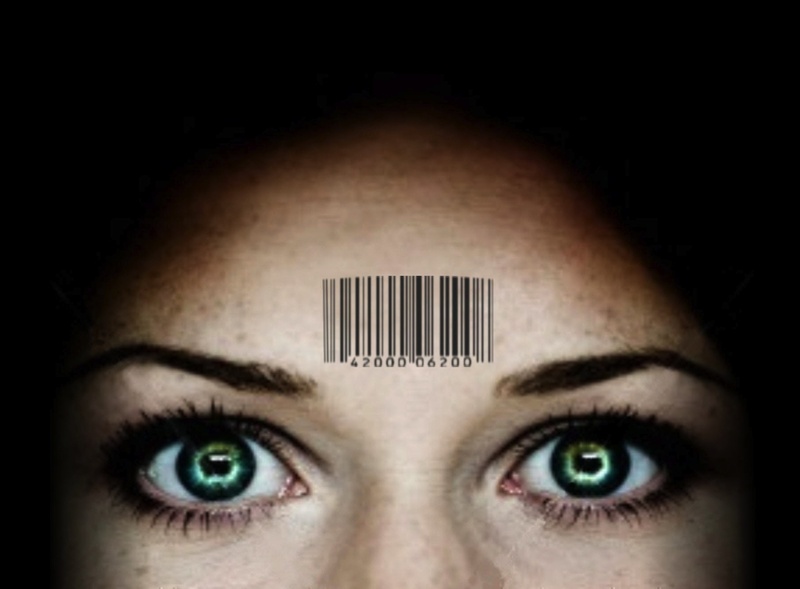 The numbering of our children – coming to all Kiwi families Real Soon. 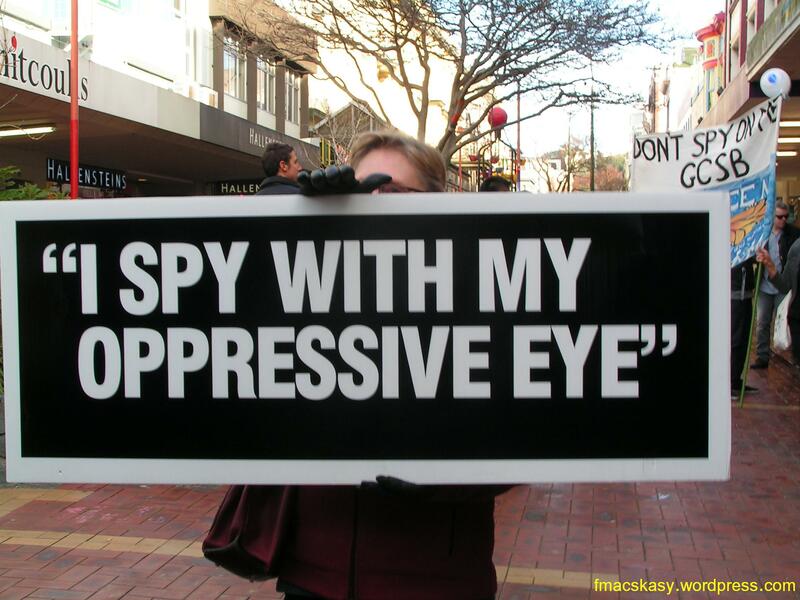 Quasi-fascists and naive right-wing bloggers such as that witless, lying fool, Cameron Slater, are positively wetting themselves with delirious joy that New Zealand is a step further to being a Policed Surveillance State. 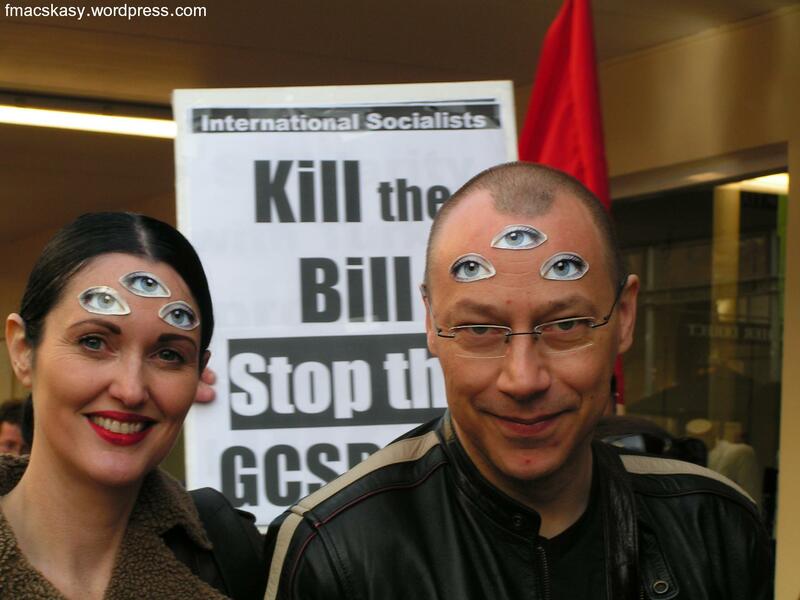 Had Labour tried to pass these two Bills, the Right would be fainting from apoplexy-inspired coronary attacks and the media headlines would be written in gory, blood-red headlines damning the rise of the ‘Big Brother’ State. God knows the fuss over shower-heads raised the level of hysteria to heights not seen since the 1950s “red scare”. But because our high-polling, smile & wave, Prime Minister is fronting this massive expansion of State power, only the Left and a few other isolated voices are vocal in their objection. Slater’s readers seem brighter than the sleaze-meister himself. 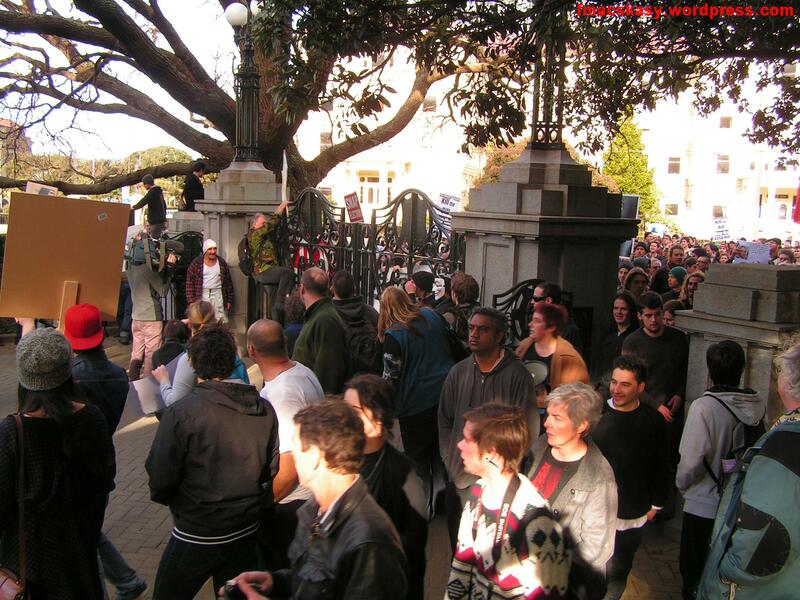 But Cows4me has made a valid point (one which Slater doesn’t – or can’t – answer). 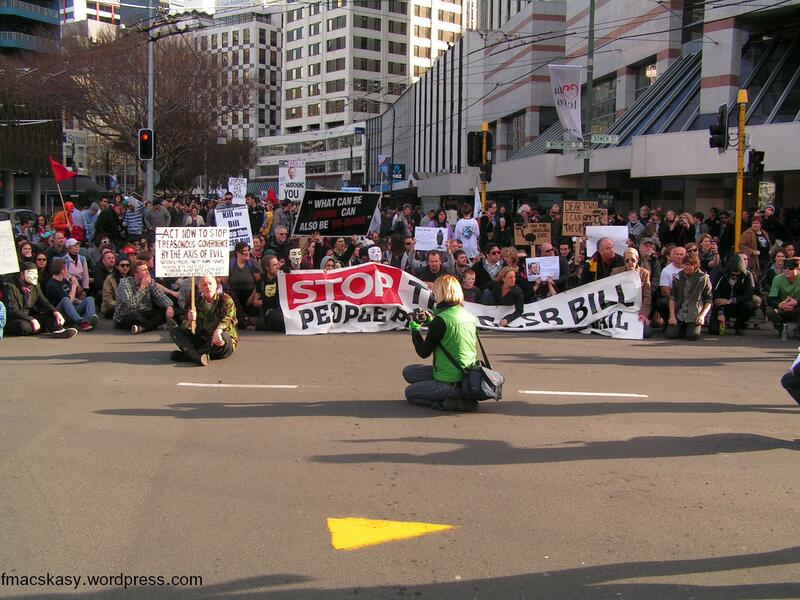 The GCSB and telco Bills are being passed by a government “friendly” to rightwingers. 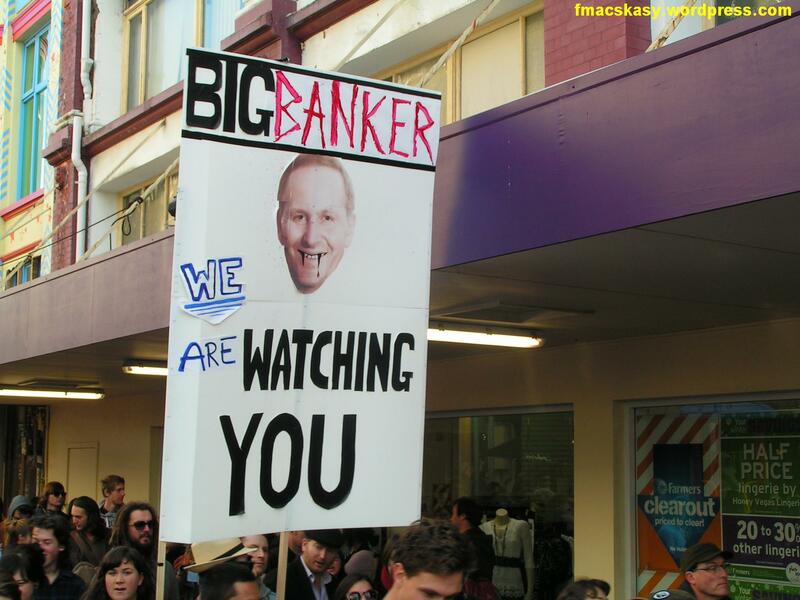 So nothing to fear, as Slater and some of his brain-numb sycophants keep telling themselves. 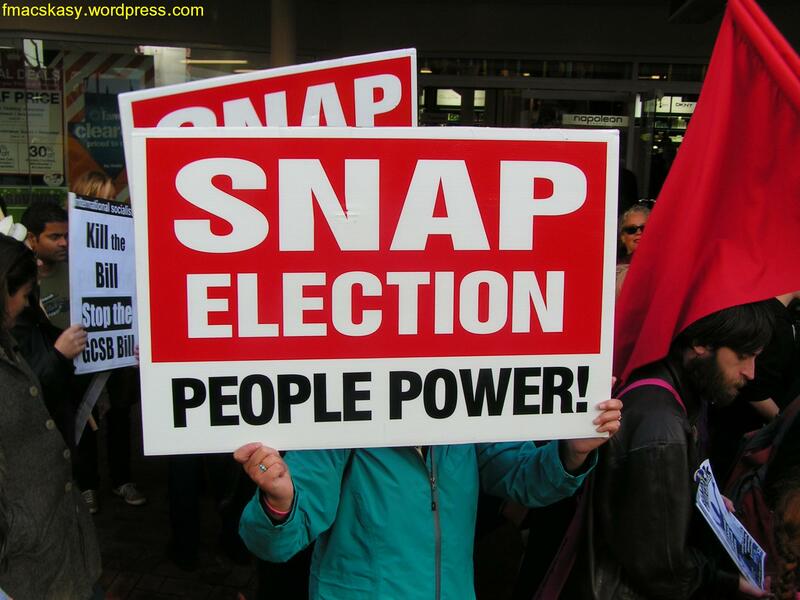 Every three years, we have these little events called “elections”. And every so often, the public – bless their cotton socks – tire of rightwing economic orthodoxy and vote for a left-wing government to clean up the social mess created by National policies. As happened in November 1999. 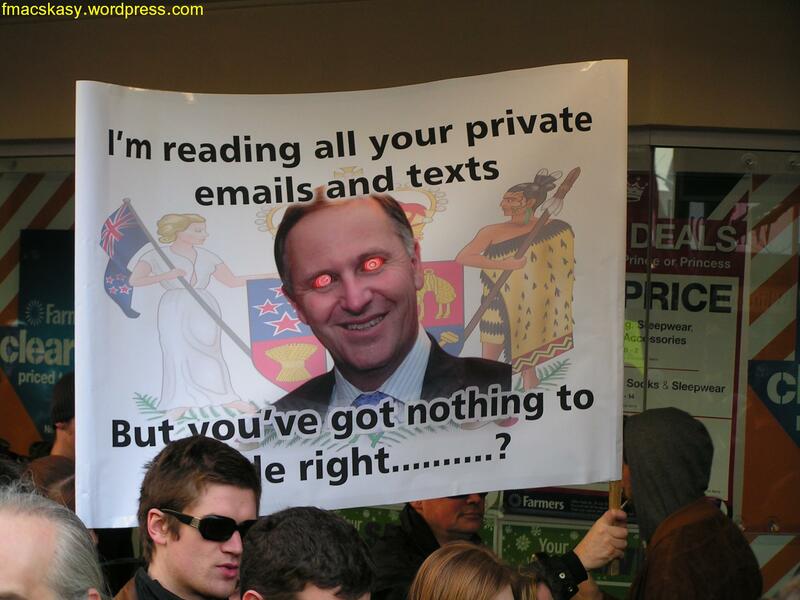 Allowing the GCSB to spy on New Zealand citizens, and employing the Telecommunications (Interception Capability and Security) Amendment Bill, gives an awful lot of power to Prime Ministers – including left-wing Prime Ministers. 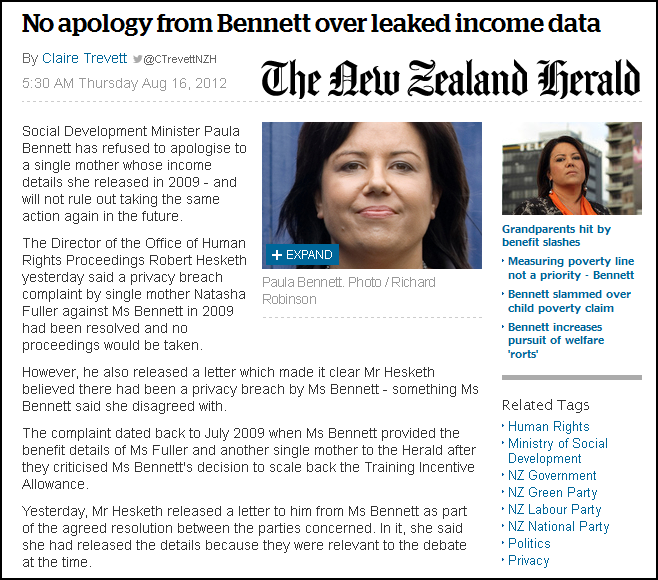 Rightwing bloggers like Slater and David Farrar often receive leaks from various Parliamentary sources. The same applies to left-wing bloggers. The Minister has a chat with the PM… the PM has a quiet word with the new head of the GCSB… the GCSB checks the internet activities of Right Wing blogger Mr X… and discovers that Mr X has been secretly chatting up young ladies on Facebook. Which is something that Mr X’s wife might take a dim view of. 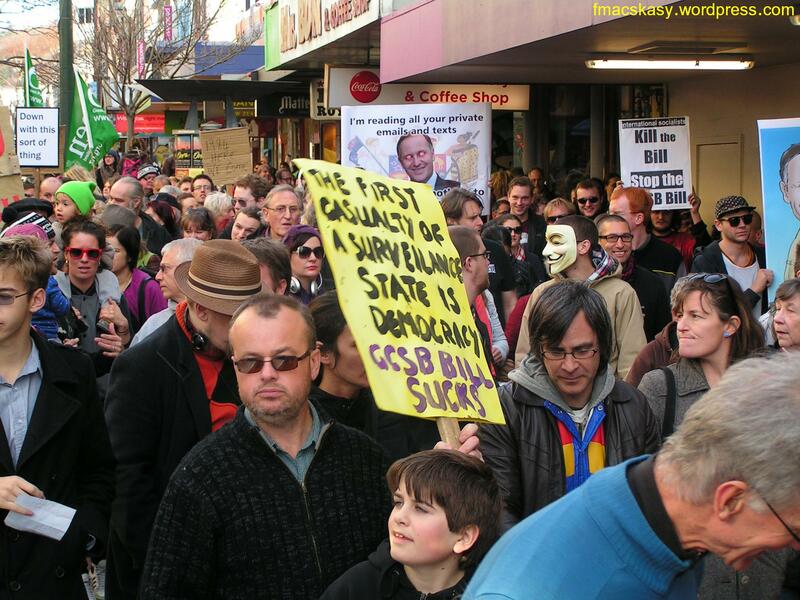 If I were Slater or Farrar or any of their rightwing fellow-bloggers, I would not be so chirpy at the GCSB being given such vast new powers. In fact, I’d be hoping that my past and current life is squeaky-clean. Same goes for commentators on right-wing blogs who hide behide the anonymity of pseudonyms. 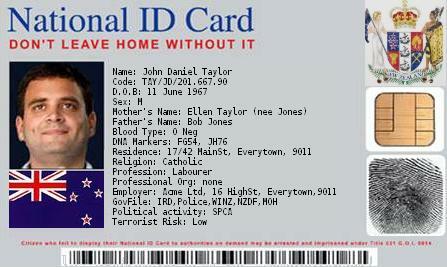 A GCSB operative checking IP numbers and relying on their new powers granted under the Telecommunications (Interception Capability and Security) Amendment would soon reveal their true identities. Imagine then, if you will, that it was discovered that a commentator was posting from a work station. How would his/her employer feel if they were informed that their employee was indulging in blogging activity during work hours? Not really. Government ministers already leak information to bloggers. Politics just got a whole lot more “interesting”. 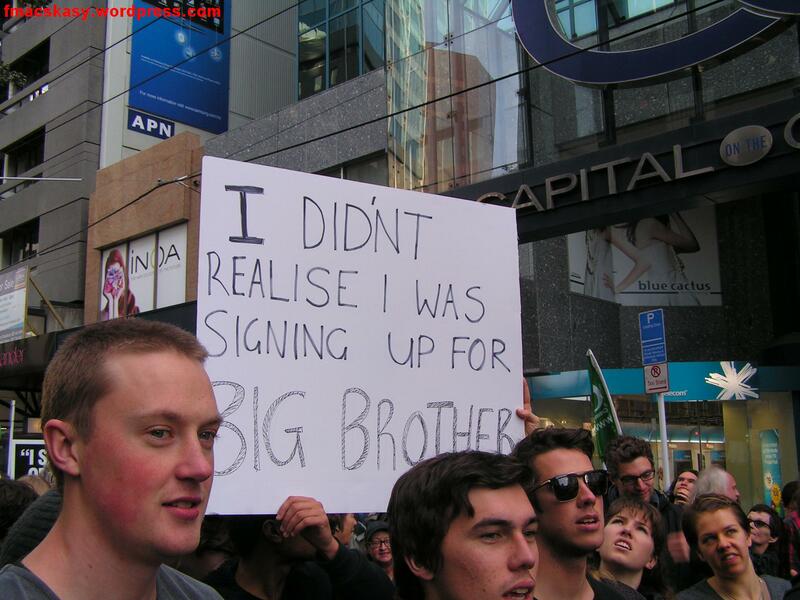 Welcome to New Zealand, the Policed Surveillance State of the 21st century. 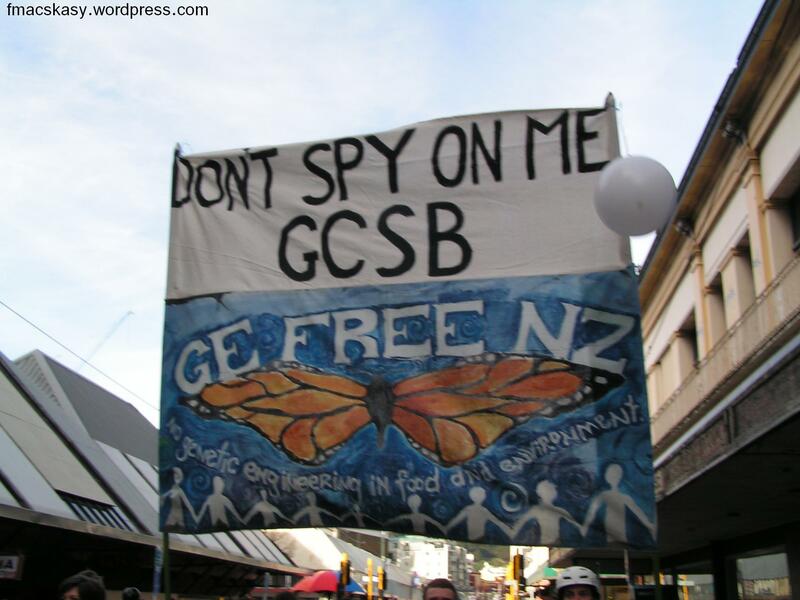 That’s what was promised about the GCSB when it was first set up in 1977 by Rob Muldoon: it would never be allowed to spy on New Zealand citizens. As people trust Key now. 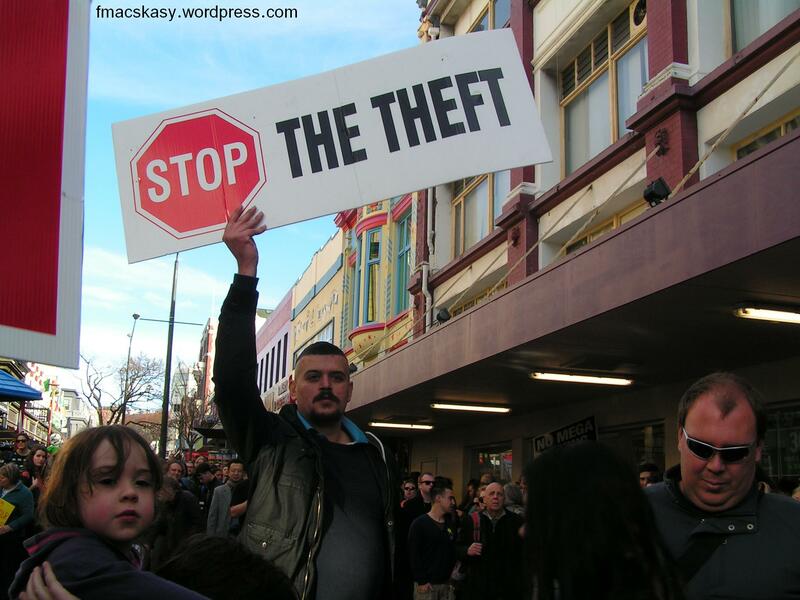 This blogpost was first published on The Daily Blog on 25 July 2013. America’s grand experiment in neo-liberal capitalism has claimed it’s third bloody sacrifice; Detroit (after Jefferson County, Alabama, and Stockton, California). Detroit now owes US$18.5 billion in debt. It has declared itself officially bankrupt – the largest US city ever to do so. The governor painted a picture of a city in collapse. Citizens wait 58 minutes for the police to respond to calls, compared to a national average of 11 minutes. Only a third of ambulances were in service in the first quarter of 2013. There are approximately 78,000 abandoned buildings in the city. The unemployment rate had nearly tripled since 2000 and the homicide rate was at its highest level in 40 years, he said. 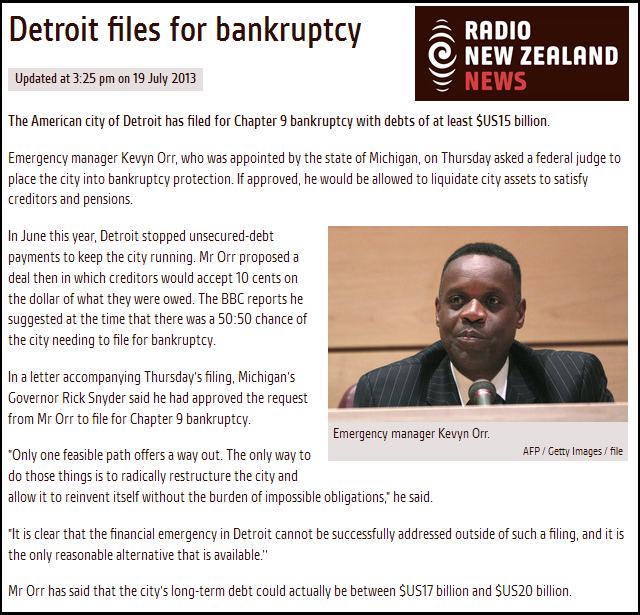 Detroit is unable to meet its most basic obligations to its residents, let alone its creditors. “Jobs in the industry have dropped by 40 percent since 2000, from 1.3 million to 800,000“, wrote Evan Soltas for Bloomberg. #1 The average age of an automobile in the United States has gone up more than 50% since 1990 and is now sitting at an all-time record of 10.8 years. The average length of a marriage in the United States that ends in divorce is only 8 years. #2 Germany made 5.5 million cars in 2010. The United States made less than half that (2.7 million). #3 When you add up salary and benefits, the average auto worker in Germany makes $67.14 an hour. In the United States, auto workers only make $33.77 an hour in salary and benefits. #4 Back in 2000, about 17 million new automobiles were sold in the United States. During 2011, less than 13 million new automobiles were sold in the United States. #5 Do you remember when the United States was the dominant manufacturer of automobiles and trucks on the globe? Well, in 2010 the U.S. ran a trade deficit in automobiles, trucks and parts with the rest of the world of $110 billion. #6 Japan builds more cars than anyone else on the globe. Japan now manufactures about 5 million more automobiles than the United States does. #7 In 2010, South Korea exported approximately 12 times as many automobiles to us as we exported to them. #8 According to the New York Times, a Jeep Grand Cherokee that costs $27,490 in the United States costs about $85,000 in China thanks to new tariffs. #9 U.S. car companies are spending hundreds of millions of dollars building shiny new automobile factories in China. #10 In 1970, General Motors had about a 60 percent share of the U.S. automobile market. Today, that figure is down to about 20 percent. #11 The combined U.S. market share of the “Big Three” American car companies fell from 70% in 1998 to 53% in 2008. #12 Detroit was once known as the “Motor City”, but in recent decades automobile production has been leaving Detroit at a staggering pace. One analysis of census figures found that 48.5% of all men living in Detroit from age 20 to age 64 did not have a job during 2008. #13 Today, only Chrysler still operates an automobile assembly line within Detroit city limits. #14 Since Alan Mulally became CEO of Ford, the company has reduced its North American workforce by nearly half. #15 Today, only about 40 percent of Ford’s 178,000 workers are employed in North America, and a significant portion of those jobs are in Canada and Mexico. #16 The average Mexican auto worker brings in less than a tenth of the total compensation that a U.S. auto worker makes. #17 In the year 2000, the U.S. auto industry employed more than 1.3 million Americans. Today, the U.S. auto industry employs about 698,000 people. U.S. car companies are spending hundreds of millions of dollars building shiny new automobile factories in China. General Motors and Volkswagen have invested billions in China, starting more than a decade ago. Ford is rushing to catch up by adding production capacity and expanding its dealer network in China. Ford and its joint-venture partner, Chang’an Ford Mazda Automobile, plan to start producing next-generation Ford Focus models at a new, $490 million plant in Chongqingin 2012. Essentially, the United States car manufacturing industry has been busy exporting it’s production facilities and jobs to other low-wage countries – China and Mexico to give two examples. This, essentially, is the end-result of eliminating tariffs with so-called “free trade” agreements. Except, these agreements are not “free” at all. They cost jobs. The first pairs of Red Band Men’s gumboots retailed for twenty five shillings and 11 pence. Red Band gumboots continued to be made at Skellerup’s Woolston factory in Christchurch until the late 1980s when economic considerations forced the company to move production offshore. 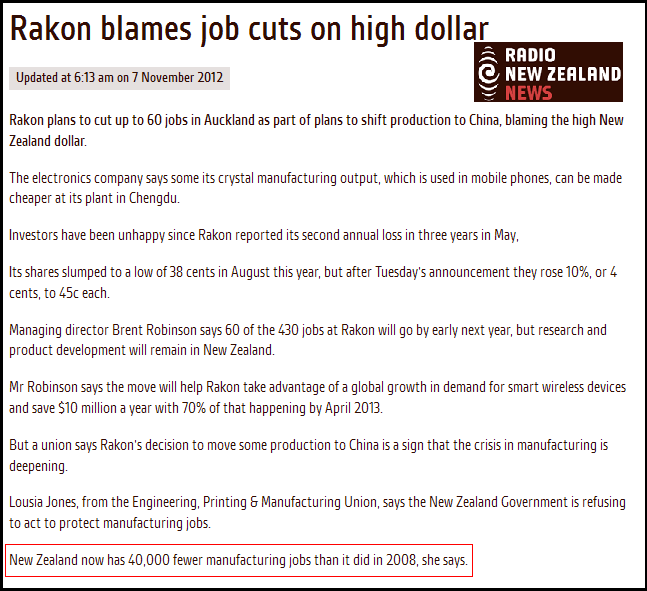 So how cheap are those gumboots made in China? The social cost is beyond a dollar value. And yet, it was not always like this. Once upon a time, we had full employment. It could be said that the cost of those cheap, foreign-made Redband gumboots (and other consumer goods) is costing taxpayers $805,759,000 per annum. Conformist middle class consumers, if they read this, would probably shrug and dismiss it from their minds. Such matters as Detroit and the pernicious consequences of the “free” market (which, as I have shown, is not “free”) on our employment, economy, and social fabric is beyond their ken. It doesn’t affect them directly so they blot it from their minds. They simply look at a pair of Redband gumboots and see the printed pricetag. After all, the capricious nature of neo-liberalism such as the fate of Detroit could never happen here, right? 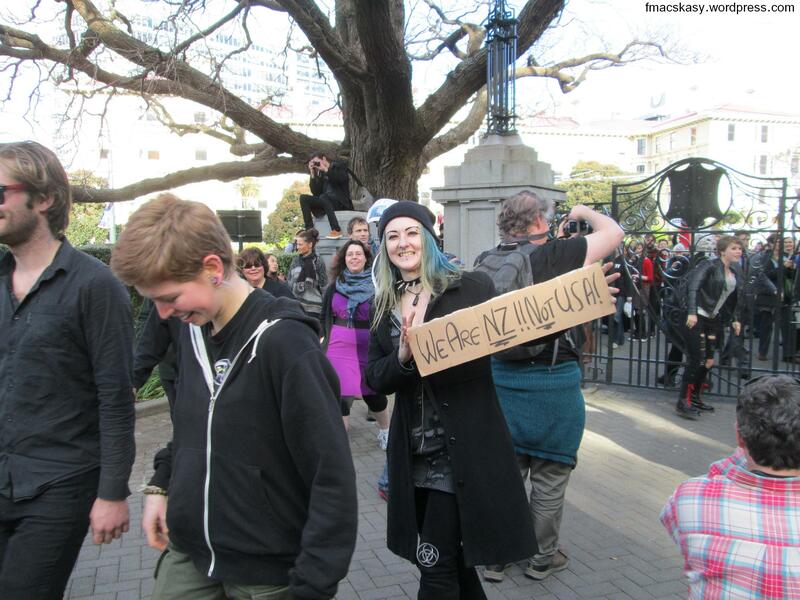 * Yes, there are other serfs in the world paid less than Kiwis. 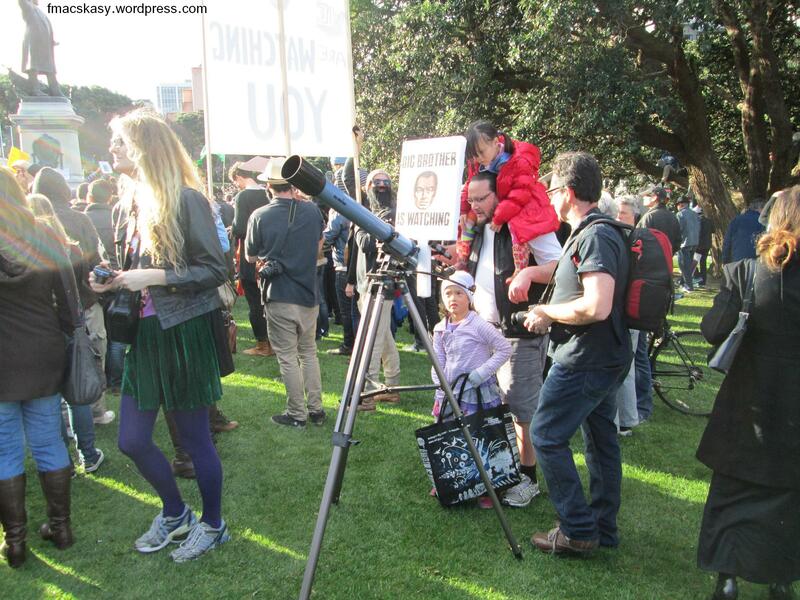 This blogpost was first published on The Daily Blog on 24 July 2013.